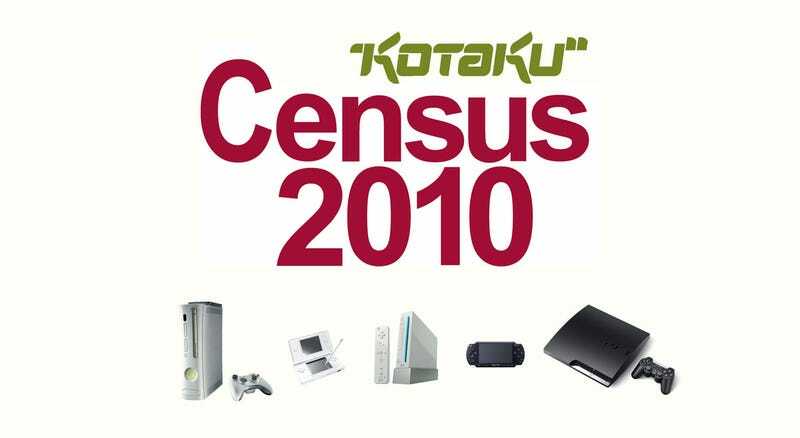 All week long, we'll be running Kotaku Census 2010, where we ask you a ton of questions, and you answer them. Our first polls are now up, and want to know all about the consoles you own. Consoles, handhelds, whatever you own and in whatever combination you own them in, the ones that work and the ones that don't, the ones you play and the ones you won't, let us know in the polls below. In response to some queries stemming from the original announcement post, I'd also like to point out this is in no ways related to advertising. We're not passing this onto our ad team, it's not being sponsored by anyone, nor is it being used by any company as market research. It's by us, for us, and for you. That's it. And when the dust settles next week, we should have a very interesting set of results. Which Current Generation Home Consoles Do You Own? Which consoles do you currently own? We'd like to know. We've provided all possible ownership options, from a single console to all three, and all possible combinations in between. Which Current Generation Handheld Devices Do You Own? Which handhelds do you currently own? We'd like to know. We've provided all possible ownership options, from a single handheld to all three, and all possible combinations in between. Which Version Of The Nintendo DS Do You Own? If you own a Nintendo DS, which of the handheld's four variants do you own? If you've owned more than one, what was the first one you bought? Which Version Of The PlayStation Portable Do You Own? Same question, only for the PSP. If you've owned more than one, what was the first one you bought? Which Version Of The Xbox 360 Do You Own? There have been a few types of Xbox 360 launch over the years, so which one do you own? If you've owned more than one, what was the first version you bought? Which Version Of The PlayStation 3 Do You Own? So many PlayStation 3 models, so little time on the market. Which one sits under your TV set? If you've owned more than one, what was the first version you bought? How Many Xbox 360 Consoles Have Died On You? This one goes out to all the 360 owners out there. For many years the console suffered from poor reliability, users complaining of everything from red rings of death to busted DVD drives to machines that would scratch discs. We'd like to know how many consoles, if any, you've had to return to Microsoft (or simply throw away) for whatever reason. Please only answer if you have ever owned an Xbox 360. Have You Had A Wii Or PlayStation 3 Die On You? Compared to the 360's problems, the Wii and PS3 have had led relatively hassle-free lives so far, their rate of mechanical failure seemingly in line with that of any other consumer product. Still, in the interests of fair play, we'd like to know if you've ever had to return (or throw away) a PS3 or Wii due to a malfunction. Please only answer if you have ever owned a PS3 or Wii. Have You Sold A Current Generation Console Or Handheld? This industry is always keen to find out how many times somebody gets hold of a console, but not so often do we hear about consumers getting rid of them. So we'd like to know, have you ever sold your Wii, PS3, 360, DS or PSP? Do You Still Use Your Wii? It's sometimes the elephant in the room when talk of the Wii comes up, so we may as well get the discussion out in the open: do you still use your Wii? At all? Or is it sitting in some closet, or gathering dust under the spare television in the spare room? And that's it for now! Stay tuned tomorrow for more, when we'll be asking you a whole bunch of new questions which have nothing to do with which consoles you own. If you want to bookmark a central repository where all this stuff is going to wind up, this is the place.